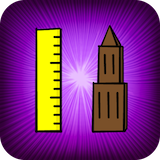 hiRise is an augmented-reality app for the iPhone that allows you to measure the height of buildings and other tall structures by looking through your camera. Simply point out the object you want to measure on a map, and see a real-time virtual ruler in the camera feed. Rather than a static photograph, hiRise employs augmented reality to create an animated ruler that appears to be part of the landscape. When you move the camera view, the ruler moves accordingly.